Europe: Destroyed by the West's Indifference? Our media and intelligentsia are always on alert to defend everything coming from Islam, from women's veils to the "right not to be offended" by cartoons. The same establishment, however, lies in a coma when it comes to Christian symbols under attack. The West today keeps on hiding its deepest secret: that there is an Islamic war going on against our own Judeo-Christian civilization. "They want Christianity eradicated, and they want to convert all Muslims to their crusade... They want it to be a holy war. And they want Christians gone. And I don't think that narrative is getting the attention it should get..." — Piers Morgan, Daily Mail. There are pictures one cannot forget -- for instance, of Russian troops hoisting their flag over burning Berlin in 1945. It was the end of Nazism but the rise of Communism. Another photo is of U.S. Marines raising the American flag over the battle-scarred Japanese island of Iwo Jima. Today the West faces another totalitarianism: radical Islam. One place that witnessed the new horror is Mount Sinjar in the Nineveh province of Iraq, once a home to religious minorities, especially Christians and Yazidis. Thousands of years of history changed when the jihadists of ISIS invaded Sinjar in August of 2014. They slaughtered men and enslaved girls and women. Christian churches were razed to the ground, and houses of worship, looted. In 2016 alone, 90,000 Christians around the world were murdered for their faith, according to a report from the Center for the Study of Global Christianity. Between 2005 and 2015, 900,000 Christians were martyred. According to Open Doors, another Christian advocacy group, one out of every 12 Christians today experiences extreme persecution for their faith; the total comes to 215 million around the world. "The persecution of Christians is real. It is global in scope, brutal in its nature, daily in its occurrence, and growing worse than ever", said University of Notre Dame Professor Dan Philpott. A recent report by the World Council of Churches put the number of Christians left in Iraq at fewer than 250,000. "Christianity is finished", said Canon Andrew White, the great vicar of Baghdad. Christians have also been fleeing Sinai: the Egyptian branch of ISIS has been slaughtering them in a campaign of "religious cleansing". ISIS released a video calling on its supporters to target Christians across Egypt, describing them as its "favourite prey". The Islamists then targeted two packed Egyptian churches, where they slaughtered 47 Christians. From Cairo to Saint-Étienne-du-Rouvray in northern France, churches now appear Islamists' preferred targets. There is, in all this bad news, a beam of hope; the valiant Kurdish Peshmerga fighters liberated Sinjar and rescued tens of thousands of Yazidis and Christians. 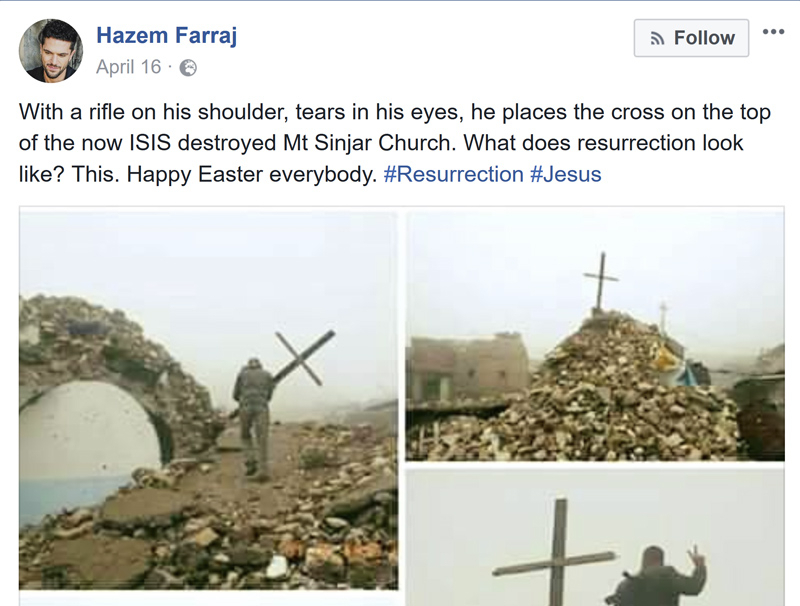 On Easter Sunday, an unidentified soldier planted a cross on the soil where a Mount Sinjar church had once stood. It was a declaration of the resurrection of life after the onslaught of the Islamic State. This cross was like the flag raised in Iwo Jima. Yet, no Western newspaper, which could help the public rally for their Christian brethren, published this extraordinary photograph. Why? Our general unwillingness to address any threat indicates a Western impotence in the face of barbarism. An editor at the Daily Mail, Piers Morgan, has commented that while terror attacks in the Western capitals all got "huge attention," the ones against Christians did not. "They want Christianity eradicated, and they want to convert all Muslims to their crusade. They want it to be a holy war. And they want Christians gone. And I don't think that narrative is getting the attention it should get in the American media and, I have to say, in other media as well around the world". "The Western world has long gotten used to the persecution of Christians in the Middle East, as if their bad lot is inevitable and simply has to be accepted," noted a Canadian philosopher, Mathieu Bock-Côté, in Le Figaro. "Christianity is destined to die or have no more than a residual existence in what used to be its cradle". While natural disasters such as tsunamis or earthquakes spur solidarity throughout the West, the disappearance of entire Christian populations and their ancient civilizations never seems to disturb anyone. Perhaps it is a sign of denial by the West. Perhaps it is the result of rejecting Judeo-Christian history and humanistic values -- those that cause the demonization the foremost victim of jihad, Israel, instead of the jihadists trying to destroy it. In 2014, we saw tens of thousands of people marching in the streets of European capitals in favor of the Palestinians, even as they were carpeting Israel with missiles and shouting "death to Israel and the Jews". We have seen how unspeakable Christian agony in Islamic lands has led to only a few hundred people turning out on the streets of London and Paris. Our media and intelligentsia are always on the alert to defend everything coming from Islam, whether women's veils or the "right not to be offended" by cartoons. The same establishment, however, lies in a coma when Christian symbols come under attack. Wilfred McClay, in an essay, "The Strange Persistence of Guilt", notes that while religion is in retreat in the West, guilt seems as powerfully present as ever, and a cult of being or protecting a victim proliferates. People rush to nurture the perfect victim: threadbare, with no identity, who has run away from "war". Christians under Islam are not part of that group. Muslims are. The West today keeps on hiding its deepest secret: that there is an Islamic war going on against our own Judeo-Christian civilization. Few people in the West see in the media the houses of Christians in Mosul marked with an "N". The Islamic State painted it for "Nasrani" ("Nazarene") -- Arabic for "Christian". A genocide symbolized by one letter. But no one sees it or cares. American television networks devoted six times more air-time to covering the death of a gorilla, Harambe, than they did to the Islamic State beheading 21 Coptic Christians on a beach in Libya, according to a study by the Media Research Center. How is it possible that the killing of a gorilla moves the Western public more than 19 Yazidi girls burned alive in a cage? Few people saw the photograph of Khaled al Asaad, the brave archaeologist who refused to lead ISIS to the antiquities of Palmyra. The henchmen of ISIS beheaded him and hung him upside down. We turned away in horror. A famous 9/11 picture by Thomas Hoepker, taken at a restaurant in Brooklyn, shows a group of young New Yorkers sunbathing, relaxed and calm, observing the smoke rising from the Twin Towers on the other side of the East River. Since then, the only enemy we ever point to is us. We censor the existential threat Western civilization is facing -- whether on an Iraqi mountain or Paris's Champs-Élysées. If Eastern Christianity can be extinguished so easily, Western Europe will be next. The reality of Christian persecution is stark. Christians are ridiculed and persecuted in the West and persecuted in Islamic nations. Muslims are honoured in the West and in Islamic nations. Christian churches have great difficulty in getting planning permission for new buildings, and for change of use in the purchase of existing buildings in the West. The building of mosques is encouraged in the West while church building in Islamic nations is absolutely forbidden. Christians are not given legal protection in the West while Muslims are. Christians are forbidden from freely practising their religion in Islamic nations while the practice of Islam is welcomed in the West and compulsory in Islamic nations. Non-Christians in the West appear to care more about Islam than they do about Christianity. They reject the West's Judeo-Christian heritage. Christians are now suffering the same persecution at the hands of Islam that Jews have always had to endure. The groundwork is being done for the implementation of Sharia Law in the West. Our Governments mistakenly believe that by being tolerant of Islam they can make it a tolerant religion. Nothing could be more wrong. By encouraging an intolerant political ideology (for that is what Islam is) to take hold of the West they are submitting and surrendering its citizens to Islam, exactly as the meaning of the name demands. The method of choice that is terrorism to achieve this is not to create terror, but to promote the appeasement of Islam and the denial that terrorism has anything to do with Islam. Islam has indeed pulled the wool over the eyes of Western Governments. 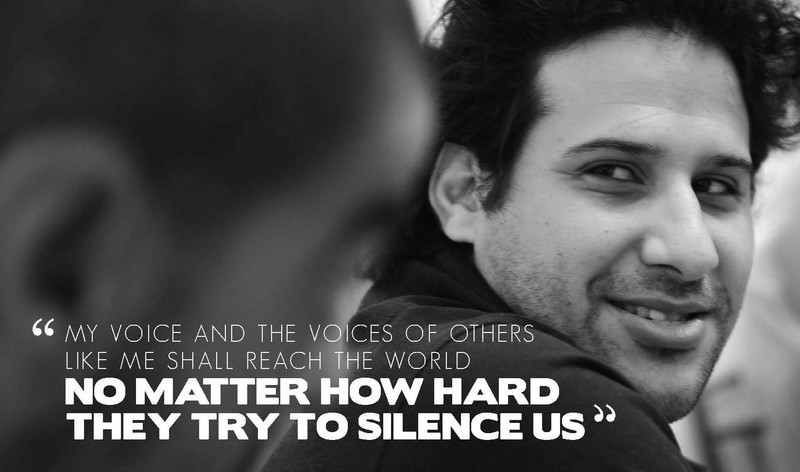 Those that know and speak out the truth are silenced by the accusation of 'racism', 'Islamophobia', and intolerance. Islam is winning the propaganda war and must be laughing at how easy it has been. How long will it take, and far do we have to go down the road of our own destruction before the West wakes up and before it is too late? There are many articles regarding the Wests' spineless reaction to the Islamisation of Europe, but no-one ever suggests why the global establishment, Soros etc are deliberately destroying the homelands for their children. Can the author or anyone else explain please? As a Bible-believing Christian, I believe the appeasement and submission to Islam by the West to be a Devil-inspired spiritual oppression and darkness, called a dominion or principality, that covers nations that have no defence against it. Islam means 'submission' and will do exactly what it says to unbelieving, deceived nations. I believe that only as Christians pray in earnest and consistently can we hold Islam at bay. Many Christians do pray, including me, but we are dealing with a very strong enemy. The God and Father of our Lord Jesus Christ is far stronger, and will help us to overcome in the end. We pray that the Lord will rebuke Islam. Globalisation is an unpopular concept in the West. The only way to counter opposition to globalisation in democratic states is to create a pretext for fear and then impose total control of all media, all communications, all movement of people, all use of Earth's resources under the guise of dealing with that fear and supposedly resisting radical Islam. Islam is to the West is what the wooden horse was to Troy. Suppose that the globalists recognise that growth in Earth's human population is unsustainable, resources will be stretched and the environment rendered unviable. How could the globalists (the world's bankers, Soros, Rothschild's etc) cull the population to sustainable numbers without mass revolt? The imposition of Islam upon the West and the encouragement by default of radical Islam by destabilising Islamic states, i.e., the Arab Spring, creates mass movement of Muslims, fear in people of democratic states. Such fear will only be repressed by governments being seen to do something about the cause of that fear. That something is more "control" over security, less freedom, more oversight of all organisations (as a policy without any focus) and control of communications. The missing element in this control is biometric identification but that too will be imposed to identify Islamic terrorists within the West. The goal is that by slowly introducing more and more "controls", the people won't react to the incremental impositions if they are seen to be for a noble purpose of "the war on terror". Ultimately, the state will control every aspect of our lives. At that point, the globalist world government can use their all pervading "control" to put down civil protest against the culling of surplus population and to identify those selected to be useful for production and maintenance of Earth's resources on behalf of the globalist cabal that sit above our elected governments. Europeans have lost their pride, values & purpose. Europeans have lost the will to defend anything as they are to busy playing games on their smartphones. European National leaders have lost to capacity to lead as they are to busy repairing their mistakes & defending their jobs. EU leaders have lost the capacity of being Democrats, as they rule the world without being elected. In Rome, the head of Christianity doesn't seem to care to much about his flock being slaughtered. Yes, Europe is being destroyed from within by indifference, fear & misplaced tolerance. Any opposition is attacked as "far right" & attempted revival as "neo-nazi"! The main problem is in the church -- not the deader-than-sin churches in Europe; but the churches in America. I am an American, raised Catholic but later converted to a "Born-Again" Christian. My Catholic relatives have an unwritten rule in their homes, not to talk about religion or politics; so the subject never comes up. Among my "Born-Again" friends, most follow the doctrine that the REAL Christians (meaning themselves, in their own eyes) will never see persecution; but will be raptured to heaven before that happens. It's hard to believe that Atheists, Jews and Pagans should be more interested in the suffering of Christians than the Christians themselves; but this may be the case. Thank you Mr Meotti, for being one of the few people who frequently highlight the plight of Christianity and the suffering church in our time. The indifference towards suffering Christians breaks my heart. It also makes me angry at our godless politicians who set the tone for the West's indifference and promotion of dancing with the Islam devil. There are many good intellectual and philosophical answers to this tragedy already mentioned by others, so I will only mention what I regard to be the underlying cause : We have rejected God and his moral law, thereby losing the gifts of love, wisdom, compassion and the other gifts of God that make us good, grateful and caring human beings. We have chosen to exchange the Truth for a lie, because we want to satisfy our own passions of pleasing the self and love of mammon. We do business with persecuting nations like Pakistan, Sudan, Saudi Arabia et al (50 in all on The World Watch List) without conditions or a care for the Christians (and Jews) they brutalize. We send armies to persecuting countries to protect our own national and financial interests and not to protect, rescue or aid suffering minorities. One cannot only point a finger at Europe, because Canada is no different under Trudeau, and America is struggling against their own subverting Fifth Column to undo all the abominations encouraged by their previous administration. There are always consequences for the choices we make. There is good news; in spite of the dwindling numbers of Christians in the ME, Jesus gave the assurance, "...I will build my church, and the gates of hell shall not prevail against it." The Western Left, of which the MSM is a charter member, is as anti-Christian as the Muslims are, and they see Islam as an ally in eradicating Christianity. They're like cancer cells which don't realize that when they kill the host, they will inevitably die as well. Once Islam conquers the West, the Left will certainly be destroyed as well. I realize you focus on the USA and Europe but have forgotten the rest of us. Here in Thailand, we have had a vicious Muslim terrorist war for the last 30 years. The Muslims claim that in the 16th century, the lower part of Siam, now Thailand was a Sultanate. In 1790 it was absorbed by Siam. Since Muslims think any land that was once Muslim must remain Muslim they have been waging a terror war based on this 250 year-old grievance. They want to separate the lower provinces and make them into Islamic states. They do the usual: kill 6-8 people every month, year after year, decade after decade, blow up cafes, machine-gun busses, kill old monks and rubber tree tappers in an effort to ethnically cleanse the Buddhists. They love to burn schools and kill teachers because they do not want the kids to learn to write and speak Thai and thus get work. They want them to speak the unwritten Muslim language, Yala, so they remain vassals of the land. They missed killing me and my wife by about 5 minutes when they blew up that Hindu shrine in Bangkok last year as we ate at that restaurant, but they did manage to kill many and burn hundreds. And yet, amazingly, Thailand remains one of the most religiously tolerant countries of the world and even Muslims are treated well and intermingle in every aspect of Thai society. They have invariably been treated better than the terrorists treat their neighbors. Quite so. The left craves transcendence, which Christianity no longer satiates, so they turn elsewhere, even to this malevolent Abrahamic splinter group conceived historically as a blunt force to conquer their ancestors, and today their own children. Judaism is, by contrast, aligned with the capitalist side of Protestantism and too familiar and integrated to have any frisson for these deluded, shallow transcendentalists. They will learn what catastrophe means too late. Meantime, they bring flowers, tears, and songs of peace to the sites of their slain countrymen, whose blood is on their hands. Haven't we " been there, done that" before? Only, last time it was the Jews who were systematically slaughtered while an indifferent world ignored the horrors of what they heard - and then saw with their own eyes? Did we not see the Turkish genocide of one and a half Armenian men, women and children? Were we all complicit in these horrors to the extent that we chose to turn our heads away Instead of act? Have our societies so inured us to self indulgence and indifference of the other, that we are virtually indistinguishable from our antecedents who conducted themselves in the same manner? It is astonishing that western democracies, believing themselves to be civilized, debate, defend, and accommodate outrageous Muslim conduct and declarations of death to " the infidel", but cannot rise to defend the one faith that promoted and facilitated the growth of both democracy itself, and the provision of plenty in their respective countries. Where DID this antiChristian force come from, and when did the tipping point from indifference to Christian adherents segue into outright hostility? Politicians and others who can and do influence world bodies such as the UN and specifically UNHR, are doing NOTHING to ameliorate the present day tragedy/ genocide of Christians in many countries of the world. Arguably, UN bodies, represented as they are by a majority of Muslim countries, are not sympathetic. But what are the EU, and all the other Western countries doing about this daily slaughter of innocent men, women and children? Christianity brought with it compassion for the other, love for one's fellow man, ( I am my brother's keeper). forgiveness, morality, love of and for our God and his son, Jesus .Christ, so tell me, do these tenets sound fearsome? Would they not - as has been proven, enable a people to goodness and greatness - again as has been proven?. After all, it is not we Westerners who arrived in the millions to the Middle East, (where life was short and and deprived) hats in hand, but the followers of a very different ideology who fled what that doctrine had created - a filed and deadly mix of politics and religion, which promised to destroy them if they remained. So wake up before it is too late! The enemy is at the gates, and if you doubt these words, look Eastward, and ponder on the nearly one million Christians who have already been put to death because they loved a different God. I have been pondering the strange love affair that the West seems to be having with a culture that actually HATES Christians & Democracy and am still throwing ideas around! I believe it may be a demographic reality in that the west by having very low birth rates has a population racing towards extinction & seems to not know or care! Maybe the powers that actually control things have decided that this is the only realistically viable alternative to continuing the industrial west ?? In looking at the DEMOGRAPHIC WINTER studies the West is Heading towards extinction & there appears to be nothing anyone can do about it ??? The failure of the supposedly Christian world to pay much attention, or take any action about Muslim persecution and murder of Christians is due more to ignorance than indifference. Leftist politics has allied itself with Islam, with both using the other to advance their interests. Since the great majority of the news industry is owned and operated by leftists, and used to promote their political agenda and suppress anything that would conflict with it, most of these incidents are not publicized by "mainstream" news outlets. They may be mentioned in passing, and never repeated, but the things the news people want the public to be aware of, and believe, are repeated for days, weeks, and months. It's necessary to go outside the generally accepted sources of news to get a more accurate and complete description of this (and most other things) -- most people don't do it, and don't know what's happening. One of the reasons why the Islamic State forces were able to easily capture Mount Sinjar and virtually eradicate the Christian civilisation in Iraq was due to the indifference of President Obama and other Western leaders to take the necessary timely action to prevent the coming to power of these Moslem extremists. Much said....nothing done and that brings me back to a certain Bible quote or was it a question...."it says: when I return will I even find Christianity...?" It is up to the remaining believers to revolt and not stand in the shadows to long because that shadow will dull your senses and eventually swallow you up. What brings me to the conclusion and latest subject of the wave of depression going into mental instability what is so prevalent now in immorality, gropers, rapes murders bombings and all that stuff. Humanity is on the downhill side. Just look at what is going on in our bureaucracy, the people that are jousting for a position in the house and senate. Look at the shameful way the democratic party is behaving with all the obstructionist behavior, twisting truth just for a place in the spotlight and all this posturing on TV for the world to see. It is unbelievable and painful for America's history. And this is what generation after generation will learn. What are we handing down to our heirs is not a good nor healthy story. It is really time to start cleaning up our act. And it start at home by restoring the family unit as God has intended a family unit should be. But is Piers Morgan actually saying the things you quoted him as saying? Piers Morgan supporting Christians and criticizing Islam?? He seems to have had a 180 degree change of perspective. Is it indifference? I wonder. More to it. How about 'emotional laziness' and 'intellectual deficit'. The need to be publicly SEEN (and applauded) as virtuous/enlightened/informed, without doing the pesky, hard, soul searching, research work. Underneath it all, not being bothered to feel the pain of distant folk. Especially if feeling that pain, and admitting to it, might lead to the need for hard research work, and (God forbid), a policy/opinion standpoint that conflicted with the meekly grazing, voter-peer sheep. And the establishment accolades. Lightweight, Pretty Boy Trudeau comes to mind, but there a millions more, all jostling shamelessly for best position in the photo op. The road to hell... is paved with fine, tear jerking speeches. Sham tears. Real challenges. How about fear of losing one's job or worse, or facing arrest if anyone complains about the islamization of our countries or about the behaviour, the slaughter, the rapes, the grooming of our children. Ordinary people are not indifferent but their mouths have been shut by our leaders and a legal system which appears to have been changed in order to allow those coming from other countries to break laws which we must keep and to ensure that we learn that we must keep our mouths shut as our civilization and the futures of our children are destroyed. "And then exhaustion, the feeling of hopelessness which can overtake people even with a high degree of material prosperity....Of course, civilisation requires a modicum of material prosperity - enough to provide a little leisure. But, far more, it requires confidence - confidence in the society in which one lives, belief in its philosophy, belief in its laws, and confidence in one's own mental powers. The way in which the stones of the Pont du Card [the great Roman aqueduct in southern France still standing] are laid is not only a triumph of technical skill, but shows a vigorous belief in law and discipline. Vigour, energy, vitality: all the great civilisations - or civilising epochs - have had a weight of energy behind them. People sometimes think that civilisation consists in fine sensibilities and good conversation and all that. These can be among the agreeable results of civilisation, but they are not what make a civilisation, and a society can have these amenities and yet be dead and rigid. "So if one asks why the civilisation of Greece and Rome collapsed, the real answer is that it was exhausted." Clark was speaking at the end of the 1960s, when rebels of the left were shaking our confidence. They play the same game today, as we, like the Classical world, are faced with barbarian invasions. And the dysfunctions we suffer today are rooted in the same sickness: indifference and exhaustion. Only today, we call these vices virtues: tolerance, diversity. Yes, equal time for fascism, misogyny, ignorance, brutality and ugliness! And those who oppose this call are branded xenophobes, racists and bigots. No doubt that's what the effete Roman élites called those raising the alarm as their civilisation was overwhelmed by the barbarians. They say those who do not learn from history are doomed to repeat it. I think the élites presiding over our own cultural demise are too stupid even to be aware of history. I think these supreme narcissists believe history began the day they were born. I'm so glad we have Gatestone especially the comments section. Reading comments like Dkjack makes me feel normal again. My best friends turn away in horror at any attempts to discuss these things. Complacency and apathy are our enemy. Europeans have only themselves to blame for the mess they are in. Who lets in millions of strangers into one's country. Get used to it — Europe is never going going to be the same anymore. That is all the world needed — one more barbaric country. GOD SAVE US ALL. Thank you Giulio Meotti and Gatestone. Great article. Thank you, Mr.Meotti, for your efforts to inform about the scourge of radical Islamists and their subsequent atrocities. I always read your columns and appreciate your honesty and courage. False righteousness on the part of news organizations combined with an apathetic uninformed public are contributing to the fall of civilized societies. People are in denial and rejecting all the warning signs. we have turned to stone. we do nothing to combat this evil that has insinuated itself into us changing us into lifeforms that are virtually unrecognizable. humorless, ignorant, unteachable, corrupt without shame or valor or honor. every shard of our destroyed lives lays around at our feet. it is the end of our story. the uniquely American story. the greatest democratic constitutional republic in the history of the world. we were cautioned to eternal vigilance. we didn't stay the watch. we are a Greek myth. All we can expect from Western media is support for Muslims. They are all terrified of the threats and intimidation and are more than happy to concentrate there focus towards those who oppose Islam and its push towards the Islamification of Western countries in which their followers now live. The media are only too happy to help them achieve their goal of totalitarianism. The media ignore all and every atrocity carried out by Muslims and instead concentrate their treachery and direct their bias against the people who want none of this Islamification taking hold in their immediate areas or indeed their country! The media lie and hide all atrocities carried out in the name of Islam and at the drop of a hat turn their attention to attacking those that speak out against Islam and the general way that Muslims act. The Muslim belief system is entirely different to any other religion, it is totalitarian and will never change despite the hopes of Western politicians that Muslims will integrate. It will never happen in a million lifetimes and it's about the fools realised that they are flogging a dead horse! The West is currently going through the times of its own decadence. Christianity has been replaced with multiculturalism, relativism and globalism, and the leaders of remnant churches are paying lip service to the anti-Christian Leftist agenda. Probably they are preparing and conducting their flock to the state of dhimmitude under coming sharia laws. The Dept. of Housing, State of CA, shoves multiculturalism down its employees' throats in sensitivity training classes. When can I object; when my gay co-workers are thrown from rooftops?? Western Civilization is the leading civilization on the planet, we build this world, we invent, produce, design, develop. No other culture has been doing that, " Tolerance and Apathy are the signs of a dying civilization " Aristoteles. Without the Western Civilization there is no future.